Myths Die Hard! Rev. Ken Joseph Jr. The passionate dream of the Republic of Turkey has almost become a reality as the European Commission yesterday endorsed that the recent reforms within this country are sufficiently enough to open accession negotiations with the EU. The official approval as well as an eventual date for Turkey’s admission, however, will have to wait for the final decision of the EU Council on the approaching date of 17 December. Yesterday, EU Commissioner Mr. Günter Verheugen admitted that the concern of the report was essentially all about a “yes” or a “not yet” answer. Thus, under the present circumstances the EU leaders responsible for the answer to this question seem to be confident that Turkey is indeed ready for the EU. Most European citizens, however, believe that Turkey is not ready yet for the EU and, conversely, that the EU is not ready yet for Turkish membership either. As stated before, in light of the experiences endured by the Syriac people in Turkey since it first applied for an EU membership in 1963 and since the approved candidacy in 1999, the Syriac Universal Alliance clearly sensed no substantial changes with respect to the official position of the Syriac people and their rights within the Turkish legislation. Nor is anything giving the impression yet that the eminent Aramaic component of the identity of the Republic of Turkey is being appreciated by the Turkish government, the media, the textbooks and the leading institutions within the country – indeed, the Turkish society as a whole. In regard to the truth, we reiterate that the SUA is not against Turkish admission into the EU as such. All we continue to ask for is essentially justice, equality, patronage and support from the Turkish government both to protect the endangered national heritage and identity of the Syriacs as well as to guarantee their future survival in Southeast-Turkey, their traditional land. At least with regard to these two conditions, the SUA is pleased and will continue to monitor the situation of the Syriac people in Turkey. We will also keep an eye to the attitude of the Turkish society and, above all, to the further reforms and policies of the Turkish government in the hope that the plight of the Arameans in Turkey may really improve in the new future. Mr. Verheugen pledged that we will see a whole new Turkey after a decade and a half. A Turkey whose values are compatible with those of the EU. Not only it is our sincere hope to experience such a new era, but the SUA even considers it her duty to assist the Republic of Turkey in realizing a positive transformation according to the European standards. The Syriac people, however, have a realistic dream too. Our dream is that of an ancient forgotten people whose culture constitutes an integral part of Anatolia, which has substantially contributed to world civilization and especially to Eastern Christianity. Certainly, the Syriacs, unquestionably the indigenous people of Southeast-Turkey, dream of a peaceful symbiosis in their age-old homeland with the Turkish, Kurdish and other peoples in the region where they can preserve their collective Aramaic heritage and identity. The Syriac Universal Alliance is a worldwide umbrella organization of all secular Syriac/Aramaic confederations and is also an international Non-Governmental Organization in Special Consultative Status with the Economical and Social Council of the United Nations. (ZNDA: Mosul) On Monday, four unidentified armed men forced themselves inside the home of Nasrin Shaba Murad, an Assyrian Christian woman, in Mosul. When Nasrin Shaba Murad, 42, housewife, attempted to escape to her neighbor's home, the gunmen opened fire and killed her. Mrs. Murad was mother of three children. Her body was transferred to Sinjar where she was buried. In Baghdad, last week, Mrs. Layla Elias Kakka Essa, 34, who was employed as a translator in Baghdad's Christian district of Dora, was killed on her way home from work. The attackers shot several bullets in her face. Mrs Essa is the mother of two and had only been at her job as a translator for a little over a week. (ZNDA: Mosul) In the face of continued violence against Christians with many being driven from the country, Christians have staged a nonviolent protest. According to a Catholic priest in Mosul, Father Nizar Semaan, Christian students had gone on strike. “Faced with the situation of serious insecurity 1,500 Christian boys and girls, enrolled at Mosul university are calling for more protection from the authorities. "The decision to strike was not easy because this is precisely what the terrorists want to make Iraq fall back into ignorance" he said. "The students also call for solidarity from the international scientific community and scholars all over the world, and urge governments to help stop terrorist violence in Iraq” Father Nizar told Fides. “Since UN sanctions were imposed in 1991, guaranteeing young people the right to study has been a priority for Mosul diocese” the priest said. Iraq is home to one of the oldest Christian communities in the world, with an estimated 3% of the population identified as Christian. Under Saddam Hussein, the Iraqi church was protected from religious persecution. Since the invasion, churches have lived under constant fear with a number of attacks recorded against Christians and church buildings, with a number of murders. Church aid agencies have also at time been forced to pull out of the country. Talks between religious leaders have been unable to prevent the violence. “Despite limited economic resources the diocese has always helped students to go to university in the awareness that new better educated generations will build a better future for Iraq" Nizar continued. "These efforts are being undermined by violence. The terrorists have threatened to blow up buses which the local Church sends to collect students in outlying villages”. “Action must be taken quickly to avoid another humanitarian disaster. 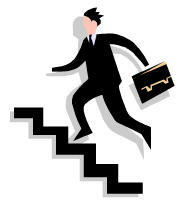 The students are confident that someone will help, but how long can they hope and wait?”. (ZNDA: Baghdad) Iraq is seeing the rise of a new version of an old phenomenon: the catacombs. "Iraqi Christians are obliged to celebrate Mass in churches' basements. They live under the constant threat of death," said Elias, a young Baghdad Catholic. He spoke with the Vatican agency Fides, raising the alarm and appealing to the international community and universal Church for help. Elias, a committed Catholic whose family lives in Baghdad and Mosul, described the trauma of Christians in the Iraqi capital. "We cannot leave the house because the street is very dangerous," he said. "At all hours of the day and night there are mines and mortar strikes that the insurgents launch against the Americans and against all those who work with the government," he added. From the young man's description, a picture emerges of a "real civil war," characterized by the daily killings of "Iraqi police, soldiers and civilians." "When one of us Christians leaves the house, one doesn't know if he will return safe and sound," the young Iraqi said. "Christian families are afraid for their children and women. Because of this, many are fleeing from the country." Elias said that "after the first attack on churches in Baghdad," "more than 4,000 Christian families have fled to Syria and Jordan. Other faithful say that they want to stay and that they are not afraid of dying. In the history of Iraq, there have already been killings against the Christian community." "In 1915, in the Christian city of Mardin, in the north of the country, there was real ethnic cleansing. My grandparents lived there. Around 1950, Christians suffered other persecutions and today this tragic history is being repeated," Elias said. Christians have described the Aug. 1 attacks on six of their churches, four in the Iraqi capital and two in the city of Mosul, as a "day of blood." Seventeen people died and more than 100 were wounded. Since that date, there have been further incidents of persecution. On Oct. 16, five bombs were detonated in five Christian churches in Baghdad. "We say Christians are also threatened because we often go to the churches to help the priests," Elias continued. "Today we celebrate Mass as the early Christians, in the basements of churches, with a few courageous faithful. We are in the modern catacombs." Elias made a strong appeal to the international community and the universal Church to do "something to resolve this unbearable situation for us. We want only peace and tranquility!" "The Muslim fundamentalists want to expel us from Iraq because they say that Iraq is Muslim land," he said. "They call us, contemptuously, 'crusaders,'" he continued. "The radical groups draw other Muslim faithful and they are often encouraged by their own leaders. I believe that 80% of the mullahs are preachers of hatred and fuel fundamentalism. "This is very serious. Sadly, if this tendency continues, Iraq will soon be a land without Christians." Christians in Iraq belong to the Assyrian-Chaldean group, the third largest ethnic group in Iraq, after the Arabs and Kurds. The total number of Christians is about 800,000, or 3%, of the population. They are subdivided in Catholics and Orthodox. Chaldeans represent 70% of the total number of Christians. (ZNDA: Damascus) The dusty streets of the Kashkol neighborhood in Damascus are filled with running children, hand-strung electrical wires and sad stories of flight from Iraq. The rows of illegally constructed cinder-block apartment buildings are home to thousands of Iraqis who have poured into Damascus over the last 18 months, often carrying only what they could fit in the family car. The number of Christians in Kashkol is increasing, as new arrivals from traditionally Christian areas of northern Iraq tell of threats, kidnappings, beatings, bombings and killings by extremist Muslim groups. "Those who come now say it's getting worse day by day. Christians cannot go out to work, to shop or to pray without risking their lives," said one Iraqi man. On a recent October evening, families sat on plastic chairs in the darkened street and spoke quietly of their experiences. There are no street lights, because the Syrian government has not approved utilities for the unauthorized residential zone. Iraqi Christians feel somewhat at home here: Across from a shop selling statues of Mary and the saints stands the Catholic parish of St. Abraham. It serves as a place of worship, dormitory, sports center, day clinic and soup kitchen. "We built it seven years ago, knowing this would become a center of services in an area that had nothing -- not even a place to play. Now all the children, Muslims and Christians, use our soccer field," said Father Malik Abdalnoor, the Melkite Catholic priest in charge of the parish. "Kashkol" means "from all places," and when the church complex was built, the neighborhood was filled with new arrivals from Syrian villages, Palestinian territories and Sudan. Then, with the start of the Iraq War, Iraqi refugees started to come. "This whole area is now filled with Iraqis," Father Abdalnoor said, pointing to the tightly packed apartment blocks across from the church. Down a dirt alley and up two flights of steps lives the family of Chaldean Catholic Deacon Joseph Toma, who fled Iraq a month before the bombing began in 2003. On the wall hangs the couple's wedding picture, one of the few personal belongings they were able to bring when they packed their seven children in a car and drove to Syria. "We were running from the war. But we were also told by some Muslims that if we didn't leave they would destroy our home," the 64-year-old Toma said over Turkish coffee in his living room. While other Iraqi Christians have said Islamic extremism has been unleashed in the aftermath of the war, Toma said anti-Christian pressure from Muslims began long before the fall of former Iraqi President Saddam Hussein. "Christian problems began in 1961, when the fighting started in the North. When the government went after Kurds, they also destroyed many Christian villages," he said. As for Saddam, Toma said he is happy to see him out of power. "I prayed to God to end the government of Saddam Hussein. If I were sick, I could not get medicine, but he built himself houses as big as Paris," he said. But Toma said that after deposing Saddam the United States has inexplicably presided over the absolute disintegration of Iraqi life. "Now it is worse. Now anyone can go around and kill, burn houses, destroy property and commit terrorism. There's no government, and terrorism is everywhere," he said. He said he thinks the United States should have immediately installed a strong president for five years to keep order in the country. The architects of the war should have foreseen the problems that have erupted, he said. Meanwhile, although he is pleased that the Syrian government allows his family to stay, Toma is unable to legally find work in his host country. He worked for 40 years for the state-run insurance company in Iraq, and before that spent two years as a houseboy in the U.S. Embassy in Baghdad. He said he thought the U.S. connection might help him and his family to emigrate to the United States. The U.S. Embassy in Damascus thought otherwise, he said, and his efforts to get visas have led nowhere. Two of his sons have managed to emigrate, one to Germany and one to Australia. As for returning to Iraq, Toma shook his head sadly. "There is no hope of going back. Where would we go? They have burned our house. And if I take my daughters there, they would force them to become Muslims," he said. He said many Iraqi Christians have similar stories to tell. "I am waiting for the world leaders to take an interest in us," he said. (ZNDA: Mardin) Britain's Prince Charles toured religious and historic sites in the ancient Assyrian city of Mardin in southeastern city on the last leg of a two-day, three-stop visit to Turkey. Mardn is considered the world's third wondrous city for its white polished marble, after Jerusalem and Venice. 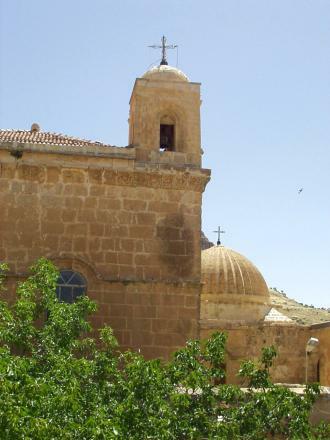 Prince Charles visited the Fifth century Syrian Orthodox Kirklar church in Mardin. The 250-year Erdoba Mansion in Mardin, a favorite place for native and foreign tourists, hosted the prince, along with his entourage and four British Parliamentarians during their visit. The Prince of Wales also visited the spectacular Deir al-Zafaran Monastery, which dates back to the Fifth century and for hundreds of years housed the patriarchate of the Syrian Orthodox Church, one of the world's oldest Christian denominations. Prince Charles attended a Christian Mass, given in the Monastery by Selibe Ozmen, a Christian Syriac Metropolitan who graduated from Oxford. Mardin, an ethnically diverse, 7,000-year-old city of imposing stone architecture, perched on a craggy hill overlooking the Mesopotamian plain, has so far failed in its long-standing effort to get on UNESCO's list of World Heritage sites. 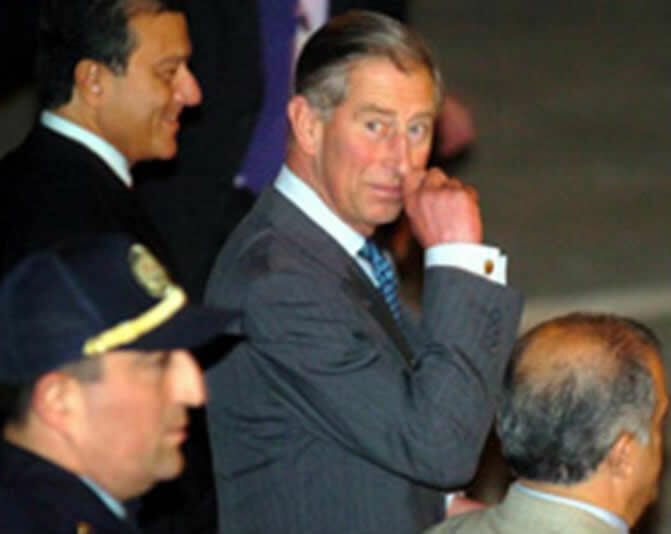 Prince Charles arrived in Turkey as part of a nine-day, three-country swing that has already taken him to Italy. On Monday, he reopened the British consulate in Istanbul that was partly destroyed in November 2003 by a car bomb attack blamed on a local cell linked to Osama bin Laden's Al-Qaeda network. He later held talks with Turkish leaders in Ankara before coming to Mardin on Tuesday afternoon. He left Turkey for Jordan, the last stop on his tour, later in the day. (ZNDA: Beirut) The Maronite Synod strongly asserted Wednesday that no compromises would be made over freedom, justice and rightful demands and hoped Lebanon would be an example of reconciliation and unity to the whole world. "There will be no backing down on rightful demands and no compromise on justice, freedom or people's dignity," the Synod said in its final statement issued 10 days after discussions began at the Lady of the Mount Monastery in Fatqa. The statement, which deno-unced Lebanon's lack of full sovereignty, said "Lebanon does not have full control over its destiny," and warned that the country was still "subject to shocks that are almost killing its independence and freedom of decision." Maronite Patriarch Cardinal Nasrallah Butros Sfeir, head of the Maronite Church, is known for calling for the recovery of Lebanon's independence and sovereignty, and for rectifying Lebanese-Syrian relations. The statement denounced that "not all the displaced have returned to their homes and lands, the economy is no longer productive ... its society is burdened with debts, its families are in danger of being dismantled ... on all levels, the ownership of its land is not protected and lands are sold to those who can afford it due to the increasing number of poor people." The statement strongly urged Lebanese youth to stay in the country and preserve it, saying that "their remaining in that land was a guarantee for Lebanon to remain free." It asserted the church was struggling with them "to solve their problems of housing and unemployment, and support them in reforming the country and purifying it from corruption, hatred and the prevalence of personal interests." During past years the Maronite Church built low-cost housing for young poor people aspiring to start a family. The church urged private schools to establish funds that would enable them to educate one in four needy children free of charge, and called on private universities to establish funds that would grant loans and scholarships to worthy students. The final statement urged Catholics and Orthodox to look for their common Antiochian heritage and live according to it. It also said that the meeting between Maronites living abroad and those residing here was "the start of a new era of unity among the followers of this church." At a meeting chaired by Stephen Pound MP in the House of Commons on October 21st, the UK branch of Iraq's leading Christian political party, the Assyrian Democratic Movement and the Christian human rights organisation, Jubilee Campaign, called for an Administrative Region for the ChaldoAssyrian Christians of Iraq, which they can administer for themselves. Article 53 (D) of Iraq's Transitional Administrative Law guarantees the ChaldoAssyrians the right to administer their own region. It states, "This law shall guarantee the administrative, cultural and political rights of the Turcomans, ChaldoAssyrians, and all other citizens." Stephen Pound MP and other speakers at the meeting, jointly organised by the Assyrian Democratic Movement (UK branch) and Jubilee Campaign, stressed that the British Government should support the creation of an Administrative Region in the ChaldoAssyrian heartland in the Nineveh Plains. The escalating attacks perpetrated against the ChaldoAssyrians by extremist and fanatical Islamic groups warrants the creation of such a region. The meeting also called on the British Government to strongly support the return of ChaldoAssyrian villages in the provinces of Nineveh and Dohuk, which the ChaldoAssyrian's Arab and Kurdish neighbours have encroached on. ChaldoAssyrians, who feel threatened, especially in Mosul and parts of Baghdad, could then move to the regions of Nineveh and Dohuk, rather than flee their ancestral homeland in Iraq. Christians have been subjected to escalating violence in Iraq, including a series of bombs exploded at five churches across Baghdad early on Saturday 16th October. There were no casualties in that incident. Islamic extremists conducted lethal terrorist bombings on Sunday August 1st against 5 churches in Baghdad and the northern city of Mosul, which killed 12 people and injured many more. On July 4th, two ChaldoAssyrian children were killed in Baghdad at their home by Islamic terrorists. Raneed Raad, 16, and her six-year-old brother, Raphid, were shot dead. Since April 2003, the assassinations of at least 88 Christians have been recorded by ChaldoAssyrian organisations in Iraq. The most recent victim was a little girl who was brutally murdered by Islamic extremists. In the wake of the August church bombings and other anti-Christian violence, tens of thousands of ChaldoAssyrians have fled, further decimating Iraq's Christian presence. The headquarters of the Assyrian Democratic Movement in Baghdad came under mortar attack in the early hours of Sunday morning, August 8th 2004. 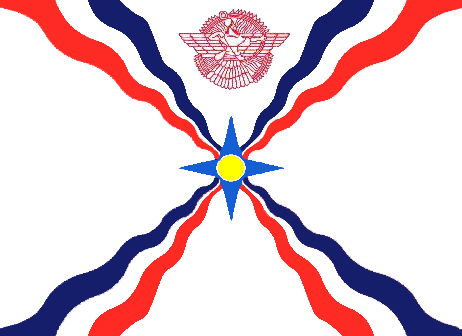 The Assyrian Democratic Movement is the leading political party representing the ChaldoAssyrian Christians of Iraq. One of this party's founders and its current Secretary General, Yonadam Kanna, was the only Christian member of Iraq's former Governing Council and is now one of four ChaldoAssyrian Christians serving in the Iraqi National Assembly. Over 95 percent of Iraq's Christians are ChaldoAssyrian and they are the indigenous people of Iraq, descended from the ancient Assyrians of Biblical times. Their language is Aramaic-based and similar to the Aramaic which Jesus spoke. The meeting's speakers were Stephen Pound MP, John Michael, an Assyrian who is British representative of the Assyrian Democratic Movement, Professor Eden Naby, an Assyrian and specialist on the Middle East, Shamiran Mako, from the Council for Assyrian Research and Development and Human Rights Without Frontiers, and Wilfred Wong, Parliamentary Officer for Jubilee Campaign. John Michael says, "If the International Community, specifically the governments of the U.S.A and U.K, want peace, stability and democracy to prevail in Iraq, thus spreading throughout the Middle East, then the security and continued presence of the ChaldoAssyrians in their ancestral homeland must be guaranteed. Therefore, it is imperative that the British government supports the ChaldoAssyrians in every respect, including the creation of an administrative region for the indigenous ChaldoAssyrian people, as granted under article 53(D) of the Iraqi Transitional Administrative Law." All the speakers supported the meeting's call on the British government to urgently encourage and support the creation of an administrative region for Iraq's ChaldoAssyrians; financially support the reconstruction of ChaldoAssyrian villages and infrastructure; provide across the board political support to the ChaldoAssyrians; assist ChaldoAssyrians in their struggle to reclaim their towns and villages; financially support the return and resettlement of ChaldoAssyrian refugees and to facilitate the ability of those forced to flee Iraq by the Hussein regime, or exiled in recent months, to register to vote if eligible. In his presentation to the meeting, Wilfred Wong stated, "There is no danger of the Kurdish or Arab community disappearing from Iraq but there is a real risk that one day soon the ChaldoAssyrian community may largely vanish from that country. Not only are the ChaldoAssyrians facing the usual risks of violence which all average Iraqis have to currently put up with in their daily lives, they are also having to deal with the additional violence of being targeted by Islamic fundamentalists simply because they are Christians and intimidation from their Kurdish neighbours because they want to grab ChaldoAssyrian land for themselves. The British government must support the forces of moderation in Iraq, which include the Christian community. Moderate Muslims would be much better able to oppose the Islamicisation of Iraq if they had the support of a strong Christian community and the British government should do all it can to empower Iraq's Christians." Stephen Pound MP says, "This meeting is only the start of a process to bring the world's attention to the terrible suffering of the Christian communities in Iraq. By meeting today we not only raised the issue in the British Parliament but also sent a strong signal of support and solidarity to this persecuted minority. No one in Parliament can now say they are unaware of the sufferings of this beleaguered community. I'm very grateful to the UK branch of the Assyrian Democratic Movement and the Jubilee Campaign for organising this meeting." To comment on these letters click on the image of the Ziggurat. I am of Assyrian decent, born in Northern Iraq and have been residing in England for the past 25 years. Today, after speaking to the people of my village (Dara), I upsettingly found out, that our Kurdish neighbors have invaded our village. The Kurdish people are building homes on our villages land, without our permission. It is sad to say, that even though this land was earned by our villagers thousands of years ago and has never seen any problem within it, that now after the fall of a treacherous dictator, our own neighbors are stealing it from us. I am not only upset that my personal land has being taken away from me, but at the same time,that the land of our villages Churches and Shrines (St. Odisho and St. George) have been taken away without any permission. Both of these are very well known and respected churches amongst our belief and the Assyrian People. Until this day, religious services are held at both of these holy sites. Also, I’d like to make it clear that 60% (if not more) of this land is owned by both of the aboved mentioned churches, and the rest not only owned by the People of Dara, but also its neighboring villages; Marastik and Komana. 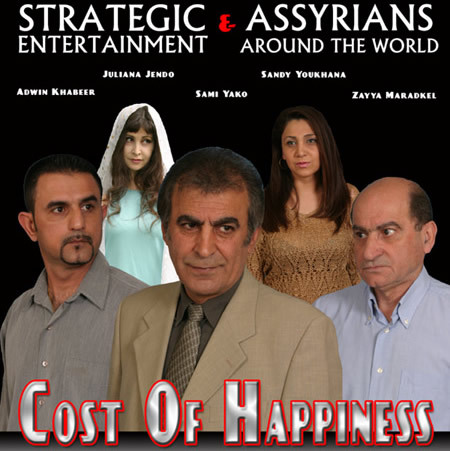 You may ask, why We (Assyrian Community and the villagers of Dara) are now crying to you. The reasoning is because, we have no hope left. We have complained about this matter numerous times, to; the Kurdish Political Parties, His Excellence Qiam Miqaam (Governor of Amadiya and Son of Mahssun). Mahssun happens not only to be a delegate in the KurdishGovernment, but also happens to be the father-in-law of His Excellency Hoshar Zebari (Iraqs Foreign Minister). All of whom are very well known to the Iraqi People and International Governments. Because of their titles/positions in the new Iraqi Government. If these persons who have been sworn in to “serve and protect” the people of there nation, are allowing this to happen and are not listening to the cries of simple villagers, then who will. NOW I HOPE YOU UNDERSTAND WHY OUR CRIES ARE TO YOU, OUR LAST HOPE, THE PEOPLE OF THE FREE WORLD. I am sending this letter to: Prime Minister Blair and all of Englands Parliament, To the President of the United States and all its Congressmen and Senators, to His Excellency Kofi Annan of the United Nations, to His Holiness The Pope, to all Catholic, Orthodox, Presbyterian, and Christian Churches and Organizations, and to anyone else that is willing to answer our cries for help. I have but one question that I’d love to ask His Excellency Hoshar Zebari and you probably would too. Why Mr. Zebari for years had you fought continuously against Saddam Regime from entering your Kurdish Villages, but now you are following his footsteps, by allowing your people to rampage My Village? To comment on these article click on the image of the Ziggurat. Father Bet-Rasho Scholarship is awarded annually; and this first year celebration was held at Encino Banquet and Garden, in Tarzana California to honor the Assyrian young men and women. Awards are based on financial need, academic merit, and church community service. The purpose of the award is to encourage our youth to attend institutions of higher learning and to help make such a worthy endeavor possible by providing financial assistance. The scholarship awards are gifts and the applicant is not expected to refund or in any way pay back the money. There are no restrictions placed on what field of study a boy or girl may wish to enter. An applicant must demonstrate academic success; and must be from Assyrian community. This is the first year this scholarship is established; and we were able to award a significant monetary amount. We owe appreciation to our sponsoring bodies; and to the effort of Mr. Albert Davidou, the Father Bet-Rasho Scholarship Administrator. We awarded eight (8) scholarships of $1000 each, one (1) scholarship for $950, two (2) scholarships of $900 each, two (2) scholarships of $800 each, two (2) scholarships of $600 each, two (2) scholarships of $500 each, three (3) scholarships of $400 each, and one (1) scholarship for $400. Total donated amount was $16,150. 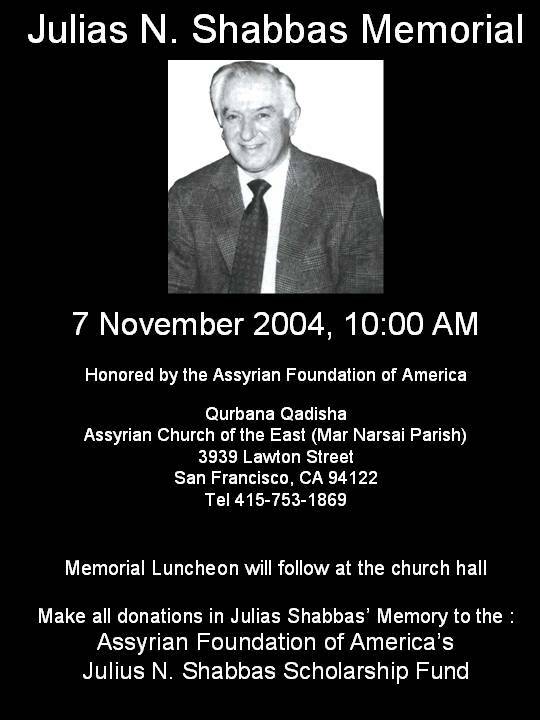 The members of the Holy Apostolic Catholic Assyrian Church of the East are proud to name this award to honor their beloved Father George Bet-Rasho. This priest continues to donate his personal time, and efforts to help our young people. The community of Los Angeles is fortunate to have this priest which has taken this parish and build it to what it is today – prosperous and growing by leaps and bounds. As the election heats up we see the likes of James Zogby and others coming out with the constant theme of the `Arab-American` vote. We all, it seems automatically assume if you are an Arab or from the Middle East you are a moslem. Nothing could be farther from the truth. James Zogbys own organization - the Arab American Institute says the number of Americans of Middle Eastern Ancestry who are moslems is 23% - that is 23% - less than 1/4 of all Americans, voters from the Middle East are moslems! Who are the rest? They are Christians! Most surveys put the population of Americans from the Middle East as 78% Christian!! Their numbers range from a low of 3.5 Million to 5 Million. It is a classic case of `spin`! Playing on the assumption by most people that if you are `Arab` or from the Middle East you must be a moslem this `spin` finds its way into policy by assuming that the Americans of Middle Eastern Vote is moslem. At the same time this figure points out the problem - the fact that 78% of all Americans of Middle Eastern Decent are not moslem but in fact Christian testifies to the fact that they have had to leave their homelands be it Lebanon, Jordan, Egypt an the many other areas of the Middle East due to the rise of intolerance. Most people are not aware that the non-moslem population of the Middle East which includes Christians, Jews and others has gone from nearly 20% to now under 2%. Jews left in the city. These seemingly unrelated facts while disturbing, also provide a `roadmap` to the future. 78% of Americans of Middle Eastern Ancestry are Christians because their population in the Middle East went from nearly 20% to under 2%. The real problem in the Middle East is economic rather than religious or political as most such problems are. What has happened is very easy to understand and the figures of 78% and 20 % to 2% help to clarify it. made life impossible for her minorities. The reality is that it was precisely these Minorities - Christians, Jews and others who literally `ran` the Middle East. It was the Lebanese Christian Gasoline Station Owners to the Assyrian Christian Storeowners in Iraq to Coptic Christian Restaurant owners in Egypt to Orthodox Christian Hotel Owners in Jordan who ran the economies of the Middle East. An Orthodox Christian Restaurant in Jordan owner explained what happened to him recently in Amman, Jordan. `I started a new restaurant. It It was doing fantastic. But then something happened. My competitors filed `blasphemy` charges against me in court. If you are a Christian just about anything you say can be considered `blasphemy` because the Constitution states `the is moslem religion is the religion of the state`. To make a long story short I went to jail for 30 days - in the end all the charges were dropped as they always are . . . but I lost my restaurant`. This is why the Christians of the Middle East have left - like me I am not going to take this anymore. It is too crazy. I am just tired of constantly being harassed!. For all of its good points the moslem religion in its radical form is not good for business - it prohibits the taking of interest among other things - the basis for a capitalist economy! The reason to succeed in Iraq is for precisely this reason - if a new Iraq can emerge with a secular constitution - minus article 7 which states amazingly `Islam is the religion of the state` against the objection of the Iraqi Government, a democratic government and a capitalist economy then the a `dominoes` of the Middle east can truly fall and the millions of non-moslems for whom the Middle East is their home can return. The Iraqi Government is increasingly worried about upcoming elections being operated by the United Nations which does not have a good reputation in Iraq. The system being used favors large, dominant groups. Many see it as setting the stage for a moslem government like neighboring Iran, added to the fact that against the wishes of the Iraq government the UN is trying to deny the right of the most progressive voters - those Iraqis living overseas to vote. The stakes are very high! If Iraq succeeds, than it can trigger a return of the millions of non-moslems from the Middle East from the United States, Britain, Australia and all over the world and restore the historic balance which will restore the economies of the region and stop the main basis for terrorism - unemployed young men! When a young man has a job, a family and a future he does not listen to a discredited, illiterate old man masquerading as a religious leader. Iraq must succeed, not only for the Iraqis but for the unemployed of the Middle East who just want to be `normal` again and for the rest of the world who wants to see them working, bringing up families instead of making bombs! Sister Olga Yaqob found her calling to serve God amid the rubble in Iraq. And she discovered her mission to spread a message of peace as a student in Boston. The soft-spoken nun with large brown eyes who stands less than 5 feet tall in her high-heeled black boots has been described by some as the Iraqi version of Mother Teresa. The 37-year-old left her parents' home in Kirkuk, Iraq, after the first Gulf War to work and live among the poor in Baghdad. After arriving in the Iraqi capital, she traded her regular clothes for a blue habit and white veil in honor of her protector, the Virgin Mary, and began to visit Abu Ghraib prison to pray with the inmates. Four years later, her bishop gave her permission to start her own religious community, the Missionaries of the Virgin Mary. It is the first religious community for women in the Assyrian Catholic Church in 700 years. In 2002, the bishop sent her to Boston College to study English and earn a master's degree in pastoral care. Little did she know then that her ministry would take a whole new direction. "Two years ago I simply thought God brought me here to study, but when I look back, it wasn't just for study - God had a plan," she told about 75 students at the Princeton Theological Seminary earlier this month. The teach-in against the war was organized by a group of seminary professors. "God sent me to Boston, where there is no Iraqi community as there is in other U.S. cities like Detroit, so I would learn English and come to love the people so much," Yaqob said. "I lived, prayed and celebrated Mass with American people, and we became so close. I love Americans." After the war started, she saw she could be an ambassador on both sides, sharing her Iraqi perspective on the war with Americans, and vice versa. Yaqob describes the effects of the war within the historical context of the past two decades. Yaqob was 13 when the eight-year-long war with Iran began. The struggle to survive and the fear of dying took over daily life during the war. Yaqob said neighbors would wake up in the morning and go check on each other to see who had died during the night. "At that age you normally dream about high school, college, what you will do with your life, but I couldn't dream," she said. "I didn't know if I would live to go to college. I felt pain and it was a mystery to me, why people had to go to war and die. For the next 25 years of my life I never found the answer." Her people were relieved when the war ended, only to see the first Gulf War a few years later and the effects of the sanctions after the war. "Those three months brought my country back 200 years," she said. Her family fled Kirkuk, an oil town, and was separated in the exodus to the desert. For three months, family members did not know who was alive or dead. "We buried a lot of people in the desert," she said. "A lot of elderly people and children didn't survive. Parents lost children, not because they were sick but because there was not enough water and bread to feed them. In the morning you would wake up and touch the bodies next to you to see who was still alive. We couldn't keep the bodies long because of the heat and had to bury them in the desert. Until today I can still smell their bodies." After the war, with the family reunited in Kirkuk, Yaqob's father decided to move everyone to Jordan, but she pleaded to stay. She wanted to become a nun and help both Muslims and Christians in the country where Catholics, whose roots stretch back to the early church, make up less than 3 percent of the population. "I gave up everything, I even went against my parents to become a religious sister so I could stay in Iraq and serve the poor people there," she said. "I wanted to be the touch of God and do ordinary things with extraordinary love." Yaqob began her studies at Boston College in 2002 and began working as a chaplain at the Catholic Center at Boston University. She returned to Iraq in the summer of 2003 because she had not heard from her family in several months and was worried. What she saw was a country she said was and still is in total chaos. But in many ways the most difficult part of her return was the unexpected reaction of friends and relatives who could not understand why she would want to live in the United States. "I told them that a lot of people here protest the war and are praying for them, but they don't believe me." Her sister suggested she had been brainwashed by the United States, and her 7-year-old niece begged her not to go back to Boston. "She said, `How can you live there auntie? Aren't they going to kill you? I cannot sleep. I'm afraid of them.' "
Yaqob also tried to comfort U.S. soldiers when she was there, but not knowing who was the enemy and who was not, they wouldn't trust her. "I love both peoples," she said. "My heart is torn in two." The war is perceived by people in Iraq as a battle between Christianity and Islam, and this perception has resulted in the persecution of the Christian minority there. Before the war, Muslims and their Christian neighbors lived in peace and respected each others' religions, but now Christians are openly persecuted. Several churches have been bombed, and many Christians have fled the country to neighboring Syria. "This war is not just about you and me, but about our God," Yaqob said. "People there see the U.S. as a Christian country, and they hate Christianity because of this war." At the end of her talk she begged the seminary students to help work for peace. "God created us all in his image - Christians, Muslims, Jews," she said. "Peace is possible. We must not give up hope. Our Lord, Jesus Christ, overcame death. We can change the whole world if we set our faith on fire." Asked by students if she will stay in the United States once her studies are complete in May, the nun said her future is in God's hands. "There is so much work to be done," she said. "I would like to be an instrument of love and continue my mission here if it is his will."